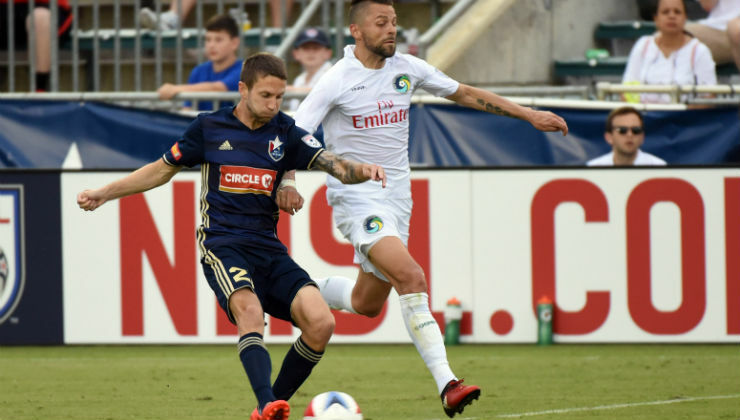 Jacksonville Armada FC announced on Friday it has traded forward Jonathan Glenn and midfielder Danny Barrow to North Carolina FC in exchange for forward Brian Shriver. Per club policy, terms of the agreement were not disclosed. Since 2016, Shriver totaled 40 appearances for North Carolina. He tallied six goals, two assists and 47 shots in 2,317 minutes of play. The veteran NASL forward was drafted by FC Dallas in the 2009 MLS SuperDraft after his college career at the University of North Carolina, but later signed with then-USL First Division club, the Fort Lauderdale Strikers. During his stint with the Strikers, Shriver made 49 appearances and tallied 10 goals in three years. Shriver then was traded to the Carolina RailHawks in 2012 where he made 56 appearances and scored 19 goals in two years. His effort earned him a spot in the 2013 NASL Best XI and won him the NASL Golden Boot, which is awarded to the league’s top scorer during the combined Spring and Fall seasons. He went on to play two seasons with the Tampa Bay Rowdies before rejoining his familiar club in North Carolina, now called North Carolina FC, in 2016. A native of Clearwater, Florida, Shriver returns to his home state to continue his NASL career. At Clearwater High School, Shriver was team captain during three years and an All-state performer. In 2004, he was included in the NSCAA/Adidas Youth All-America. He went on to play in Orlando for the Central Florida Kraze, currently known as Orlando City U-23. Midfielder Danny Barrow joined the Armada FC in late 2015. Barrow came to Jacksonville following a pair of short stints in 2015 with English National League South clubs Bath City FC and Truro City FC along with trials with Major League Soccer’s Sporting Kansas City. He totaled 710 minutes in 16 appearances with the Armada FC and was named to the NASL Team of the Week twice. Jacksonville signed forward Jonathan Glenn in early 2017. The Trinidad and Tobago native tallied one goal and eight shots in 14 appearances. He also received one Man of the Match and NASL Team of the Week honor. Before the Armada FC, Glenn spent three seasons playing in the Úrvalsdeild, an Icelandic soccer league, where he was a standout player in 2014 for ÍBV. Glenn scored 12 goals in 20 matches, second-most in the league, and received the Golden Boot and Player of the Year awards from his club.